For the last decade or so, June has been decreed World Elder Abuse Awareness Month. Falling somewhere midway between National Random Action Month (January) and Fruit and Veggies — More Matters Month (September), the significance of the honorific likely gets lost on most people. But the fact that it exists at all signals a sea change in awareness of an issue long feared and ignored. Every year, according to the National Coalition Against Domestic Violence, well over two million older Americans are subjected to physical, psychological, and other forms of abuse and neglect that qualifies as domestic violence. So far, the bill has been unanimously approved by the Senate Judiciary Committee — a promising start. Bonnie Brandl, founder and director of the National Clearinghouse on Abuse in Later Life, emphasizes that in the case of seniors, abusers exerting power and control include family members and caregivers as well as domestic partners and spouses. Financial — including stealing or denying access to money, misusing a power of attorney or guardianship. Domestic violence includes sexual abuse — sexual contact or behavior that occurs without the older adult’s explicit consent. Like other forms of such conduct, perpetrators are most often spouses or partners if the older person lives at home in the community. Photos from the crime scene show large shards of broken glass that was deeply embedded in Mary’s legs when the grandson forcibly dragged her from the house across the yard into a shed and back. When older people are sexually abused while living in facilities, the perpetrators are caregiving employees 43% of the time, and other residents in about 41% of the reported abuse incidents. 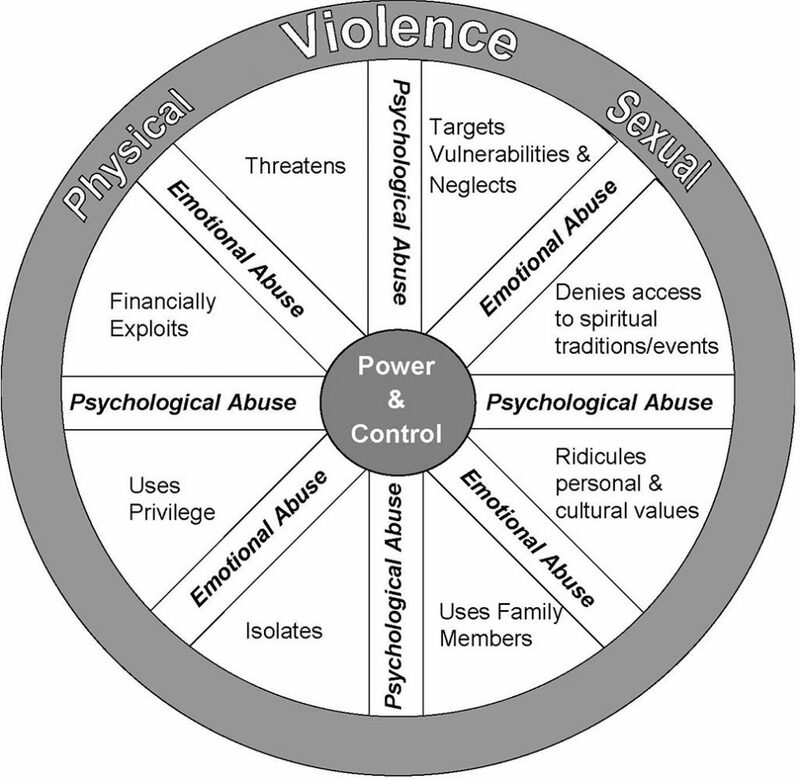 The Abuse in Later Life Wheel, adapted to seniors by the National Clearinghouse on Abuse in Later Life, graphically depicts the physical and sexual aspects of domestic violence, with power and control at the center. Studies consistently show that a great majority of such abuse cases among elders involve women who are abused by their spouses. In long-term relationships, the bad behavior has usually occurred throughout the couple’s time together, though elder abuse may also occur in later life relationships with new partners. And occasionally, there is “late onset elder abuse” — a change to violent or abusive behavior that may also be a function of substance abuse, anger issues, or cognitive disabilities that develop in older age. 9% were other family members. And older women are likely to suffer far more severe health-related trauma than younger women who survive these forms of domestic violence. Discomfort about being touched, or wearing many layers of clothes. Experts also advise gently asking the senior about the signals spotted, without being accusatory. And when the older person has become withdrawn and unavailable, it may be essential to invite him or her out — away from the suspected abuser — or get other individuals into the home as often as possible to help monitor what’s going on behind closed doors. Finally, those who are prompted to ask questions about suspect domestic violence must be ready to listen to the senior’s answers — and not judge or scold. It’s also helpful for those who are concerned to be equipped with some knowledge about the realities and complications of domestic violence and to have outside resources he or she can consult for help. Groups offering helplines, shelter, legal advocacy, and other support to those subjected to domestic violence — particularly battered women — have been around for decades. A growing number of them, though not all, now offer help and support specifically targeted to seniors; usually it is free or low-cost and confidentiality is assured. You can report suspected instances of elder domestic violence or abuse to the Eldercare Locator at 1-800-677-1116, which should be able to put you in touch with the appropriate local authority. It is helpful if you can provide the address and zip code of the person you suspect is being abused. S. Department of Justice Office on Violence Against Women.